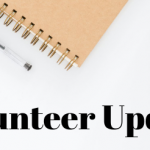 Fox Valley Hands of Hope’s Adult and Children’s Bereavement Team is excited to share upcoming summer events and one-day workshops they’ve been busy at work developing! Some are brand new programs, some are long-standing, but each program is open to the public and free-of-charge. For more information or to register for programs, contact 630-232-2233. 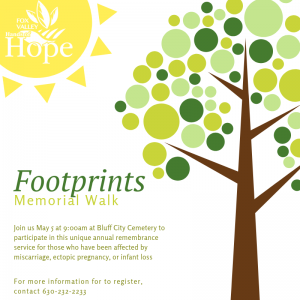 Footprints Memorial Walk — Sunday, May 5th at 9:00 a.m.
Join us May 5 at 9:00 a.m. at Bluff City Cemetery to participate in this unique annual remembrance service for those who have been affected by miscarriage, ectopic pregnancy, or infant loss. For more information or to register, contact 630-232-2233. Memories of Mom Workshop — Monday, May 6th at 6:00 p.m. 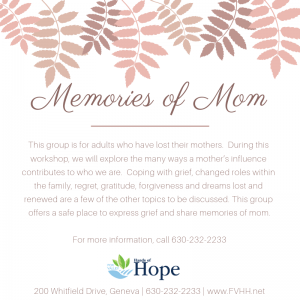 This group is for adults who have lost their mothers. During this workshop, we will explore the many ways a mother’s influence contributes to who we are. Coping with grief, changed roles within the family, regret, gratitude, forgiveness and dreams lost and renewed are a few of the other topics to be discussed. This group offers a safe place to express grief and share memories of mom. Memories of Dad Workshop — Wednesday, June 5th at 6:00 p.m. 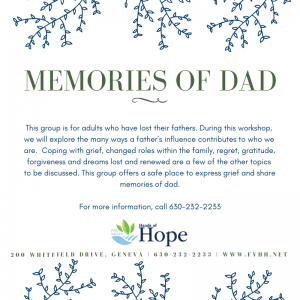 This group is for adults who have lost their fathers. During this workshop, we will explore the many ways a father’s influence contributes to who we are. Coping with grief, changed roles within the family, regret, gratitude, forgiveness and dreams lost and renewed are a few of the other topics to be discussed. This group offers a safe place to express grief and share memories of dad. Project Hope Summer Sessions — All Summer! School may be out but our offices are open! 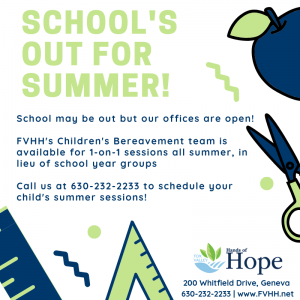 FVHH’s Children’s Bereavement team is available for 1-on-1 sessions all summer, in lieu of school year groups. 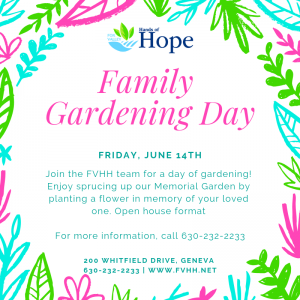 Join the FVHH team for a day of gardening! Enjoy sprucing up our Memorial Garden by planting a flower in memory of your loved one. Open house format! 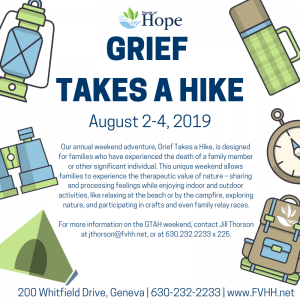 Our annual weekend adventure, Grief Takes a Hike, is designed for families who have experienced the death of a family member or other significant individual. This unique weekend allows families to experience the therapeutic value of nature – sharing and processing feelings while enjoying indoor and outdoor activities, like relaxing at the beach or by the campfire, exploring nature, and participating in crafts and even family relay races. 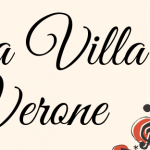 For more information on the GTAH weekend, contact Jill Thorson at jthorson@fvhh.net, or at 630.232.2233 x 225.